Throughout 2017, the FSAT worked with consultants from Crossroads Resource Center and New Growth Associates to perform a local food economy assessment for Wyandotte County. They interviewed 56 stakeholders and held 5 small focus groups with a total of 24 residents to determine the state of our food system from strengths and accomplishments to challenges and gaps. They produced a 130 page report which you can read below, as well as ten recommended actions to strengthen our community-based food system. We also put together a set of easy to read infographics about some of the most important parts of the report, some of which you can see here on this page, or access in pdf format below. We were surprised that we buy so much food from outside our county when we could be supporting our local farmers and our local economy. In fact, if everyone in Wyandotte County bought just $5 worth of items from local farmers per week we could generate $42 million annually. That's $42 million that could be circulating and supporting our community instead of siphoning into the pockets of non-local corporations and businesses that are not invested in the well being of our residents. In fact, one of the major strengths of our county is how much food we produce, but our agricultural land is in jeopardy. We have seen a steady decline in farmland acreage over the last few decades, and we've lost 14% of the farms we had in 2007. Our farmers are struggling to support their families because of the decreasing prices of commodity crops combined with the rising costs of running a farm, so they are selling their land to developers. Food access continues to be a major barrier for our residents, farmers and other residents alike, and almost 20% of our population is food insecure. In 2015, Wyandotte County residents utilized $40 million in SNAP federal nutrition assistance money to buy food from grocery stores and farmers markets. Also, every $1 of SNAP money spent generates $1.79 in economic activity by supporting local businesses like independent grocers and small farmers. 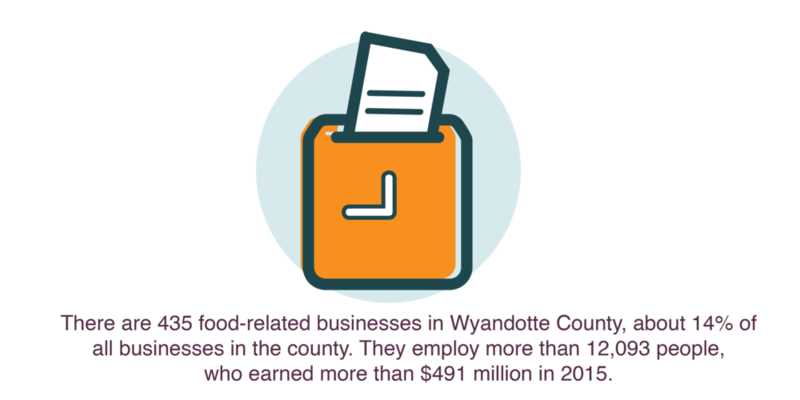 Wyandotte has a relatively low enrollment rate for SNAP, but if we enrolled 100% eligible individuals, there would be $18 million more spent on food in our local food system. Wyandotte County has a limited number of grocery stores, and without regular access to a personal vehicle it is much more difficult to access high quality, affordable food. That is why the FSAT is working on improving grocery access by updating the mobile vending ordinance to allow mobile markets to serve residents in community spaces where they live. More grocery stores have closed than opened over the last decade in Wyandotte County, which is a similar story to many urban, low-income low-access areas throughout the country. The County also has an abundance of discount stores, which provide some types of food, but rarely, if ever, carry fresh fruits and vegetables. Also, the major grocery chains that have locations in Wyandotte are much better known for discount prices than quality, fresh foods. Our residents deserve access to high quality, culturally appropriate foods, and the FSAT supports the opening of full service grocery stores throughout the County, but especially in the Downtown and Northeast areas where there is high need. Food is a fundamental part of Wyandotte County's economy. These businesses employ almost 17% of all Wyandotte County employees, and make up about 15% of the payroll. This is why the FSAT firmly believes in building a strong community-based food system that supports small, local businesses and provides fresh, high quality foods for everyone.